This is the third in a series that examines the challenges NU faces as it strives to become a global university. At Northwestern, 750 students study abroad every year, according to the Northwestern University Study Abroad website. Many students consider it an essential educational experience, for language acquisition, exposure to different cultures or the chance to live outside the U.S. But for some, the threat of terrorism is a significant deterrent. 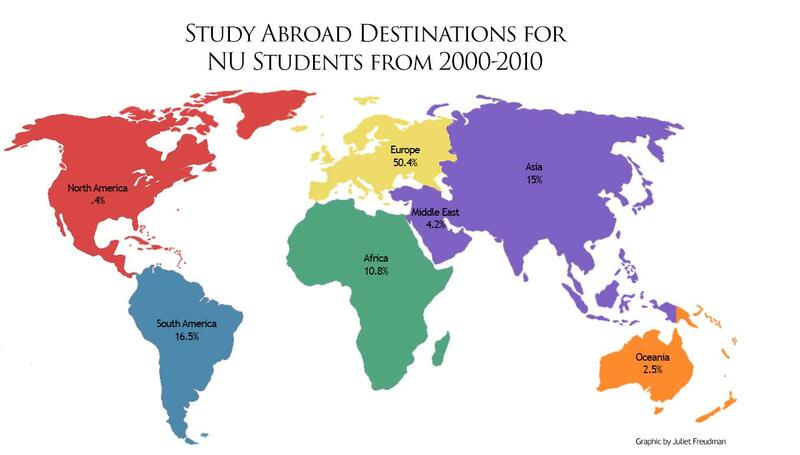 Europe has historically been the most popular destination for NU students. According to the study abroad office, more than half of the university’s study abroad participants heading for the continent from 2000-2010. Yet, following the series of deadly attacks that occurred in Europe last year, students and their parents have expressed concerns about safety, with some choosing not to study abroad at all. Some students considering going to France said they were especially affected following the 2015 Paris attacks, as a number of the victims were students in the city. Weinberg junior Iris Dew explained she chose not to go to Paris in the fall of 2016 because of her parents’ concerns about the threat of terrorism. Iris’ family is not the only one that expressed fear about study abroad. Alejandra Diaz, a junior studying public health, noted over email that her mother expressed great concern about her decision to study in Paris and told her to avoid popular destinations or protests. And junior Fallon Gallagher, an International Program Development student, commented in an email that her parents were “definitely nervous” about her studying in Paris, but never attempted to dissuade him. Although fears about terrorism are not totally unfounded, parents in particular tend to miscalculate the real risks involved with terrorism. The Forum on Education Abroad estimated last March that students are more than two times as likely to die studying in the U.S. than studying abroad. When analyzing risk, people tend to overestimate the threats others pose, an issue that is exacerbated by the intense media coverage of violent events. Risk perception may also play a role students’ decisions not to study in other regions, such as the Middle East. Although NU has strong ties to the region due to its campus in Qatar, only 4.2 percent of study abroad participants choose to study in the area. Within the Middle East, NU hosts programs in only four countries: Israel, Qatar, Jordan and Morocco. However, NU runs programs in 21 European countries, a discrepancy that may reflect reactions to instability in the region. For example, American programs in Syria were popular until the 2010 revolution. Likewise, Inside Higher Ed reported there were more than 1,000 American students studying in Egypt before the Arab Spring, but in 2014 there were only 37. Despite safety concerns, encouraging students to study abroad is more essential than ever. While most American students are privileged enough to travel abroad with relative ease, recent events, such as President Donald Trump’s travel ban and crackdown on undocumented workers, may indicate that travelling to the U.S. will become more difficult for international students. If international representation at NU becomes less diverse, giving American students the opportunity to experience other cultures firsthand through study abroad will be even more essential. Study abroad plays a vital part in combatting perceptions of American exceptionalism. The U.S. is not the center of the world and by embracing foreign cultures, American students are reminded of the value of different cultures. In a country divided by difference, studying abroad and becoming comfortable with diversity may be the best way to teach young people to bridge internal divisions.